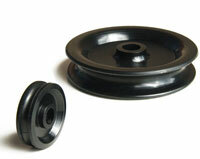 Round Belt Pulleys to suit 3mm and 6mm diameter round belting. These drives are suitable where a synchronous drive is not required. These pulleys run with our Round Belts. 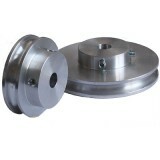 Select from our range of round belt pulleys below. Grooved Pulley, 20mm diameter, for 3mm Round Belt ..
Grooved Pulley, 40mm diameter, for 3mm Round Belt ..
Grooved Pulley, 60mm diameter, for 3mm Round Belt ..
25mm Dia. Idler Pulley, 1/4" Bore, to suit 3mm Belt ..
Grooved Pulley, 40mm diameter, for 6mm Round Belt ..
Grooved Pulley, 60mm diameter, for 6mm Round Belt ..
Grooved Pulley, 80mm diameter, for 6mm Round Belt ..
57mm Dia. 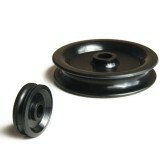 Idler Pulley, 8mm Bore to suit 6mm round Belt ..